Glenn Dean, Desert Giant, Oil, 40"x48"
While a passion for simplicity might seem to be a bit of a dichotomy for someone born and raised in the vibrantly active Southern California beach community of Torrance, 38-year-old landscape painter Glenn Dean emphasizes that this is the quality he strives for, both in his personal lifestyle and most decidedly in the creation of his dramatic Western landscapes, which portray nature in its most basic forms. Dean dabbled in art during high school, but his youthful interests primarily centered on life at the beach, were he swam and surfed and even considered body boarding as a career. His fascination with art hit with a vengeance when he was in his twenties and encountered paintings by Early California Impressionists and Western landscapists working at the turn of the century. Looking for a direction in life, Dean attended a junior college in San Diego for a time, but became discouraged by the fact that art instructors were not teaching the techniques he wanted to learn. So Dean eschewed a formal art education, preferring to discover answers to his questions about the complexities of design and composition by pursuing an independent course of instruction. 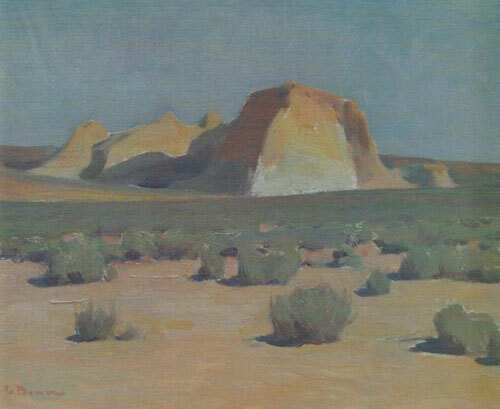 He bought a plethora of art books and began to study the work of deceased Western landscapists such as Edgar Payne and Maynard Dixon. 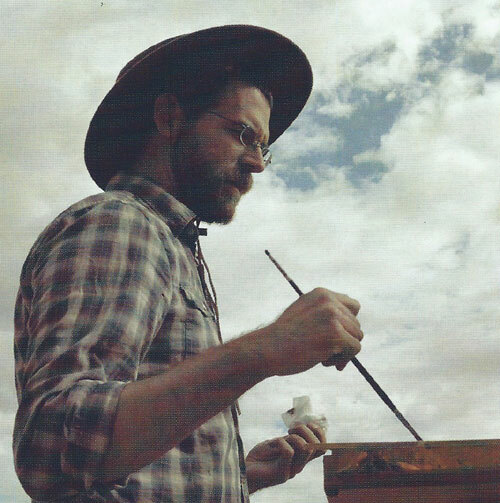 “My mother was also an artist, and she took me along with her to Arizona, where we painted en plein air,” Dean says. 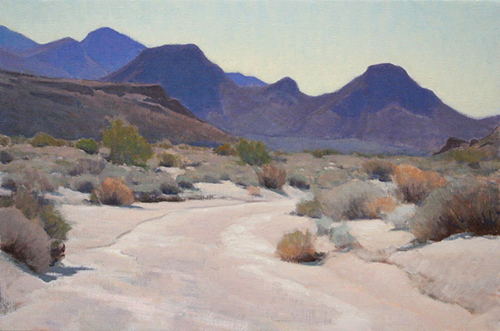 “Working alongside her, I found that that I truly loved painting landscapes, and within two or three years, I was selling my work.” In addition to those sales, Dean’s work also was earning awards, including the Emerging Artist Award from Art and Antiques magazine at the Carmel Art Festival in 2001 and the Grand Prize and Artist Choice awards at the Sonora Desert Museum Painting Invitational in 2003. Today, Dean continues to find inspiration in works produced in the early 20* century. Artists of that period, he says, depicted nature by painting, primarily, the essential information, recording what they saw and giving it an artistic interpretation. ‘Their paintings emphasized the importance of seeing the color of light combined with interesting compositions and seemingly effortless designs,” he says. For Dean, the work of those artists revealed the spiritual element of the landscape, a quality he feels should be the primary goal of the landscape painter. In 2003 Dean moved further up the coast, to Los Osos, where he began to record his daily observations by doing field studies, sometimes returning to the same spot several days in a row in order to gain a complete sense of the location. While his preference is painting on site, of necessity he works on larger canvases in his studio, where he can spend more time fully developing the composition. Looking for a change of pace from depicting California seascapes and the Arizona desert, Dean moved to Santa Fe New, Mexico in 2006. “It was really helpful to me to work with the different subject matter and quality of light,” he says. “Although I wasn’t especially conscious of it myself, artist friends observed that my palette had gotten brighter.” Still a Californian at heart, Dean began to feel the call of the ocean and returned to the familiar coastal setting in 2010, where he currently works out of a home and studio in the small town of Cambria. Explaining the attraction of the area, he notes, “Not being a tourist destination, it’s much quieter up here, and, surprisingly, there is still a lot of open space.” As a more mature artist, Dean’s current oeuvre consists of a variety of subject matter, ranging from the Tetons and Lake Jenny in Wyoming, to Monument Valley in Utah and the California coast.When it comes to painting the ocean versus the desert or mountain scenes, he says he does not have a particular preference. “I like the different light qualities I find in diverse locations,” Dean says. “Mountains, desert, or ocean, they all have their own unique beauty, and that is what I am trying to portray. Nature never repeats itself, so my paintings always have a certain freshness and mystique.” It is that ability to move easily between such diverse subject matter that makes Dean the perfect choice for galleries in Jackson, Wyoming and Scottsdale, Arizona. Glenn Dean, Land of Titans, 30"x30"
Glenn Dean, Sandstone and Sage, oil, 12"x16"
Glenn Dean, Afterhoon Shadows, acrylic, 16"x20"
One gallery owner says of him, “He is the type of artist we search out—artists with a natural honesty in their work; let’s call it integrity. His special appeal is that he paints from the California plein-aire tradition, somewhere between Dixon and Payne, but takes it further. 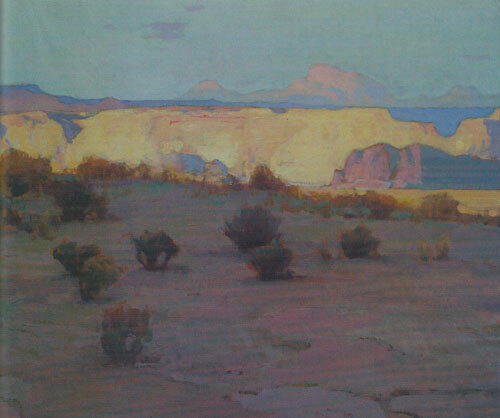 His work is often softer edged and has his unique muted palette. I think what makes it (even more) powerful is his minimalist approach, a reductive impressionism.” In his own words, Dean says that, while his work is simplified, he tries to achieve a distinctly realistic quality. Although his blended colors might have a softer feel, his forms often are sharply delineated against the sky or adjacent objects. “In most of my paintings I actually work with a handful of shapes,” he says. ‘When I begin a painting, I generally have an idea in mind, but sometimes it evolves as I paint. In the past, I tended to get frustrated when a composition didn’t turn out the way I had imagined it, but now I am more open to letting my painting evolve, letting the color harmonies and shapes happen, letting the unconscious take over.” Figures seldom appear in a Dean composition. “If I include people, they are a suggested element that I use in order to show scale or to allude to the environment in which they live,” he says, adding that his views most often are devoid of human reference, because he feels that man is nature’s worst enemy. "I strive to convey the landscape in a simple and truthful way." While Dean’s larger canvases require that he spend time in the studio, he notes that, after too long at the easel, he gets antsy to get back on the road to gather reference material. As a single man with no ties, not even pets, he says, “My lifestyle is very simple right now, so I am able to take off whenever I choose and stay in locations as long as it takes me to acquire the reference material I need.” That freedom has allowed Dean to participate in an intensive three- week retreat at the historic Maynard Dixon Home and Studio in Mount Carmel, Utah, on an almost yearly basis. 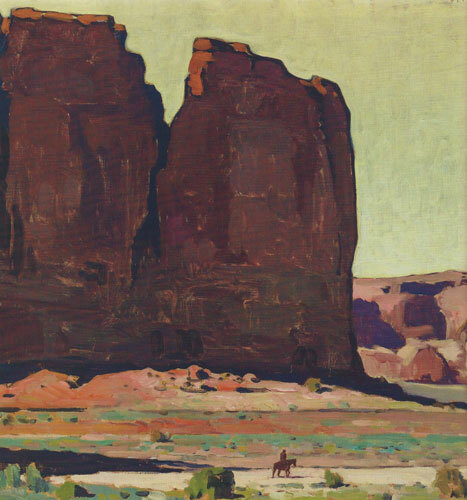 Operated by the Thunderbird Foundation, which is committed to preserving Maynard Dixon’s legacy, it is a unique program designed to free artists to live and work in a setting unencumbered by distractions and where they can interact with other working artists. Located just outside Zion National Park, artists find inspiration in the oasis of cottonwoods, streams, magnificent vistas, colorful sandstone cliffs, and the area’s celebrated cloud formations. In May 2013, Dean received the Foundation’s Gold Thunderbird Best of Show Award at its annual Maynard Dixon Country Show. "This was a huge honor for me, because it was voted on by my peers,” he says. 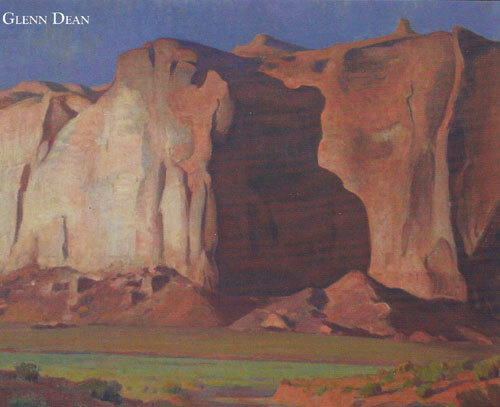 Dean recently received further affirmation of his skills, when a collector donated his painting, Desert Giant, a 40” by 48” rendering of towering red sandstone cliffs, to the National Cowboy and Western Heritage Museum in Oklahoma City, Oklahoma. That painting is now included in the museum’s permanent collection. In fact, Dean is one of only five non-Prix de West artists to have their paintings in that prestigious collection. While it is clear that he has joined the ranks of up-and-coming artists, dean says his goals for the future come, not in the form of participating in more exhibitions, or being represented by more galleries, but rather in being able to achieve a certain level of aesthetic excellence. “If nature is my model, I must be observant that she never repeats herself,” he says. “She is limitless in the concepts she presents, her effects of light, her variety of colors, shapes, textures and designs. As an artist, I approach each painting with reverence and awareness for these attributes found in nature, and I strive to convey the landscape in a simple and truthful way. Myrna Zanetell is a writer living in El Paso, Texas.